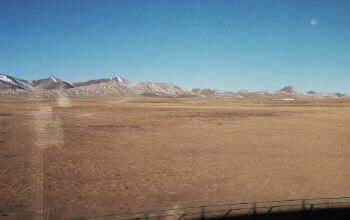 Our day-long train trip across the Tibetan Plateau on November 7, 2006 was at the end of autumn meaning that year the countryside was largely clear of snow and ice. Possibly we saw the countryside as bare as it gets, which allowed for stunning views and photography. It is difficult for me to imagine how it would look in winter. The weather was beautifully clear with only an hour, or so, of cloud cover. 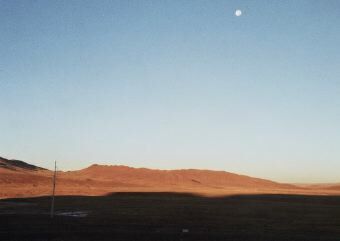 Photo in the pre-dawn twilight (altitude above 4,000 m). 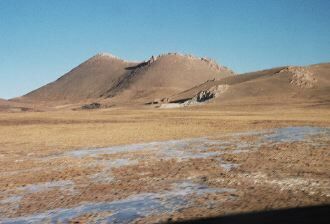 The road to Lhasa was a constant companion for most of the train trip. 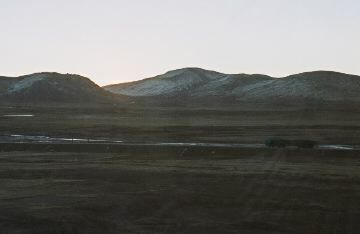 Sunrise on the northern Tibetan High Plateau and a truck lumbers through the twilight. I had hoped to have awakened before Golmud, but had slept through it. I awoke just before sunrise and then it was a matter of establishing where we were. I had limited means of navigation. I didn't have a GPS. I had 2 crude maps and a compass on my watch band. There was also a scrolling LCD display above the door at each end of the carriage's corridor. Ninety percent of the information shown on these displays was in Chinese which I can't understand. However, if you watched carefully there were occasional brief snatches of English which showed invaluable information: altitude, speed of the train, distance to the next station and the station name. You had to watch closely because if you missed one, it took a long time to come around again. My notes made on the train show the next station on the LCD display was Amdo and I recorded successive indicated altitudes of 4647 m, 4787 m and 5071 m. All these means were sufficient to establish that we had not yet reached the Tangga-la Pass (5180 m) on the border of China and Tibet. Our passage through the pass, a little while later, was indicated by an increase in the speed of the train. Full moon over Tibet. Note the beautiful clear sky. The shadow in the foreground is that of the train in the early sunrise. Note: All the photographs shown on these web pages of the Tibetan Plateau were taken by the author/web master and are in the order they were taken. At the northern (high) end of the Plateau there were few signs of habitation and little snow cover. Frozen ice laying on the ground in the foreground. 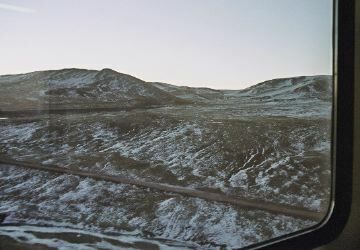 Barren countryside with snow powdered hills in the distance. The moon is closer to the horizon. There were regular instances of short lengths of barrier fences and hatched ground works. Do some research for an explanation of the purpose. 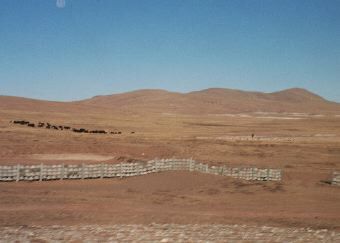 A herd of yaks and their shepherd (off to the right) with the railway short barrier fences and earth works in the foreground. 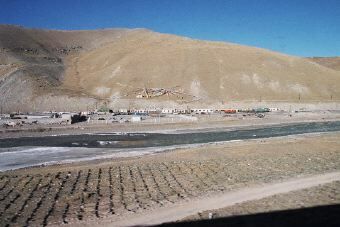 After the initial barreness of the high end of the Plateau, groups of livestock with a herder became a regular sight as the train approached Amdo approximately 100 km into Tibet. Each group of livestock is supervised by a herder - there aren't any fences. Some herds were close to towns, whereas others appeared to be a long way from a town. 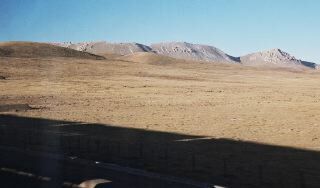 I had expected the Tibetan Plateau to be a barren place like the Nullabor Plain in Australia. It isn't. Townships are widely spaced, but they aren't vast distances apart. From the train, it's not possible to know how the people along the rail corridor earn their living. The herding of livestock is important and was a common sight. When in Lhasa I was told there is a short period in summer when vegetables can be grown on open river flats which is an important source of fresh food. This could be also the case in other areas. What cottage industries, or local industry, exist is not known. 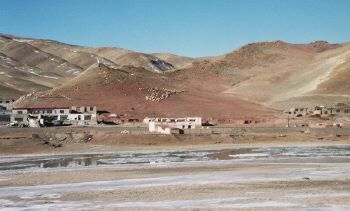 A sizeable town on elevated ground above an icy river. 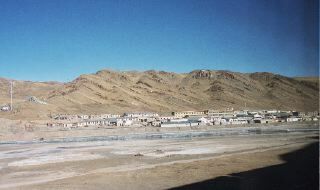 A communication town is on the left of the photo with a flag pole festooned with prayer flags beside it. Towns were sizeable and houses substantial, if basic. 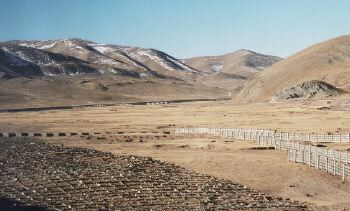 The Tibetan Plateau supports a sizeable population of people. Whatever activities there could be in summer away from a town, it would be necessary to retreat back to the towns in winter. Prayer flags can be seen above this town in the centre of the photo. There is a fenced construction yard at the front. After the event, it is difficult to reconstruct if these are different towns, or the same town. However, it is thought they are 3 different towns. Again prayer flags are flying behind the town. The structure of the track was generally an elevated earthen embankment ( as shown earlier) with light fences on either side of the embankment. There are regular openings under the embankment and breaks in the fences allowing movement of animals and flowing water. 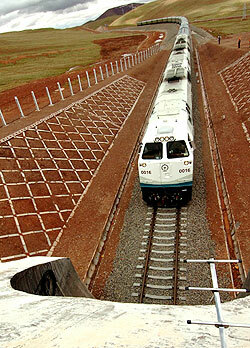 The barrier fences and hatched ground works were regular features along the track. 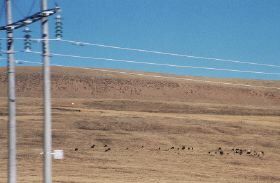 Here the railway runs along flat ground between the hills. 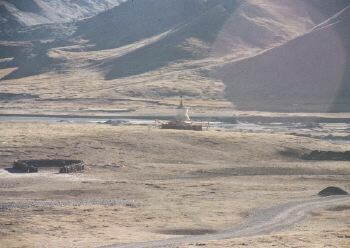 A lonely stupa guarding an empty corral with a local road in the foreground. The grass seemed to be short tufted grass. While not a good photo (they're hard to take from a moving platform! ), it shows modern communication infrastructure providing new services in a remote area. 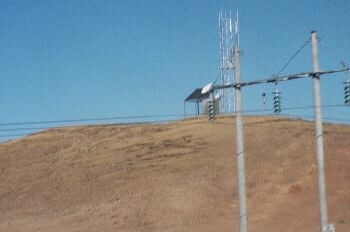 A possible interpretation of this photo (like other installations seen) is that the equipment on top of the hill is a solar-powered satellite TV receiver which retransmits TV programs to local viewers. Possibly it is for a mobile phone network. Advice of the actual purpose would be appreciated. 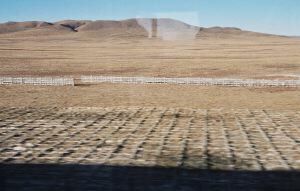 Reportage of the day-long train journey across the Tibetan Plateau has been broken into 3 pages to make it more digestible. You can reach Plateau 2 and Plateau 3 by clicking on these links, or on the tags at the top, or bottom, of this page.